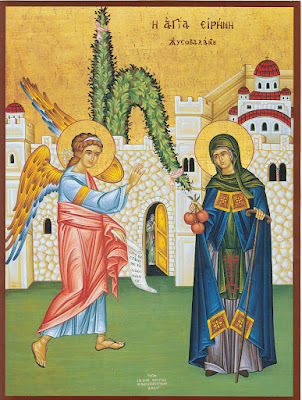 On the twenty-eighth of this month [July], we commemorate our Venerable Mother Irene, Abbess of the Sacred Monastery of Chrysovalantou, the Wonderworker. And now you dwell where peace abounds. 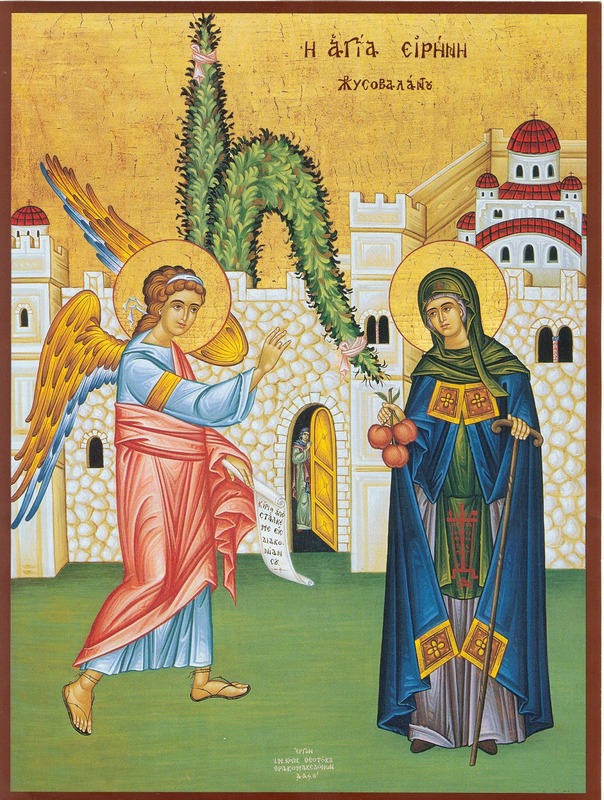 On the twenty-eighth Irene entered divine rest. 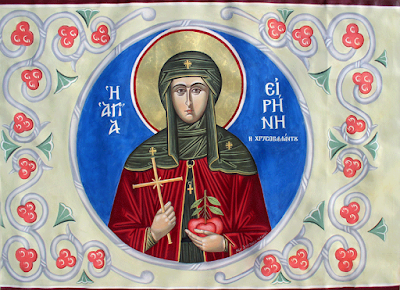 Venerable Irene, who is glorious in name and a wonderworker, flourished in the ninth century, and was born in Cappadocia, to a wealthy and notable family. Like an offshoot she bloomed, and was physically beautiful, had a good disposition, and shined with all modesty. When Empress Theodora sought to find a suitable spouse for her son Michael, she sent a decree throughout all the land under her rule, to gather all those who were physically beautiful, whose manner of life was blameless and preeminently virgins in calling. Among these was Irene, who came from Cappadocia. And so it happened that while other virgins gathered to be the wife of the emperor, the all-wise one dedicated her entire heart and soul to the heavenly Bridegroom, abandoning all things, such as great wealth, lofty dignity, glory, honor and all other fallen things, and became a nun, choosing the gentle and sweet yoke of Christ, becoming a monastic at Chrysovalantou Monastery. This was located in the Queen of Cities, on the fifth hill, near the cistern of Aspar. She showed herself to be equal in life with the Angels, and she became a vessel of service, a precious dwelling-place and a wealthy treasure of the Holy Spirit, wondrously gifted by the life-giving energies, thus becoming a rich dwelling of divine grace. By heavenly election, she was selected to be anointed Abbess of this Monastery, and she shepherded the monastics there in a wise and God-pleasing manner. She was a model and example to them in actions, words and works, and in all manner of struggles and good success. She performed many miracles and amazing works with power, to the amazement of all for the grace she received, driving out demons, healing the sick, seeing the disposition of the soul and hidden things of the heart towards correction, and future things as well as present circumstances she foretold accurately. And wondrously the emperor, through the power of the Holy Spirit, beheld her in a radiant light, and was vastly amazed, for she required of him to cancel an unjust condemnation. Wherefore the admirable and great Irene, both in conduct and life, having become famous to all, who pleased her bridegroom Christ in all manner of ways, was translated full of radiance to the heavenly bridal chamber, in deep old age, having lived to 103, on the 28th of July, and her face shined like the sun at the time of her departure, having seen and smiled at the sight of the holy Angels beside her. Her revered relic was placed in the sacred Monastery, which poured forth many healings like a river, for those who approached her with faith, to the glory of Christ, Who glorifies His Saints. Through her intercessions, Christ God, have mercy and save us. Amen. Not a temporal kingdom on earth didst thou obtain, but Christ, thy most comely Bridegroom, vouchsafed thee heavenly crowns, and thou reignest as a queen with Him eternally; for thou didst dedicate thyself unto Him with all thy soul, O Irene, our venerable Mother, thou boast of Chrysovalantou, and mighty help of all the Orthodox. Leaving all the world behind with its impermanent glory, thou wast wedded unto Christ, the King immortal and holy, bringing Him as precious dowry thy maiden beauty and thy trophies won through abstinence over demons. O Irene, our venerable Mother, entreat thy Bridegroom to show His mercy to us. 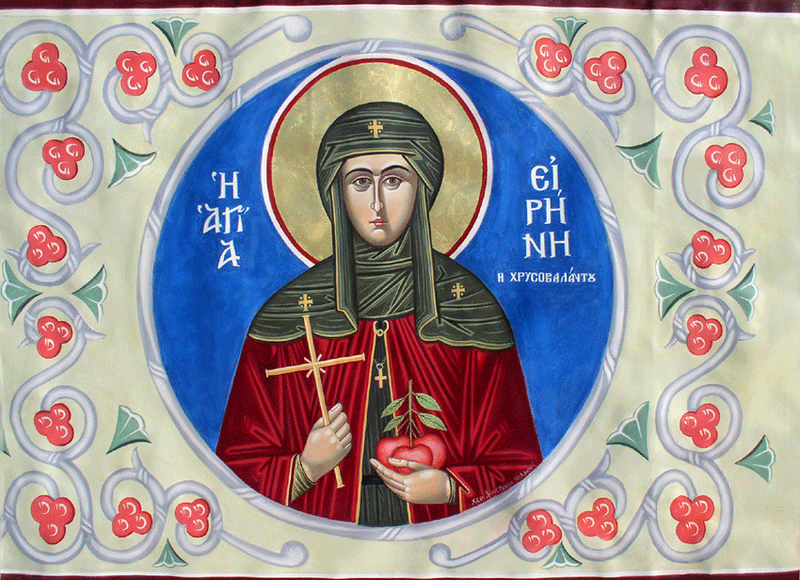 The beauty of Cappadocia, leading Chrysovalantou without error, the fountain pen of heavenly peace, Venerable Irene, we honor thee with hymns.